Tulip-lined boulevards and drizzly warm days are signalling to Vancouverites that it’s time to plan our next outdoor adventure. Lucky for us, so many stunning trails, lakes, and mountain views are just a short road trip away. Taking inspiration from 7-Eleven’s new healthy snack options, which the company added to their shelves earlier this year, we’ve rounded up seven outdoor destinations just outside of the city. Pack up the car with family and friends — and stop for some tasty snacks to keep yourselves fuelled up while you’re out and about, no matter when your adventure begins. Ring in the new season at these incredible places, all less than an hour’s drive from Vancouver. Drive the beautiful Sea-to-Sky Highway up to where the Squamish River and Howe Sound meet. The estuary is home to hundreds of different species of birds and other natural habitats. Take a wander through the salt marshes and mudflats for scenic views. The spit is also known for its windiness, making it an ideal spot for kite-surfing. Just remember to suit up in a dry or wet suit if you’re planning to be out on the water. 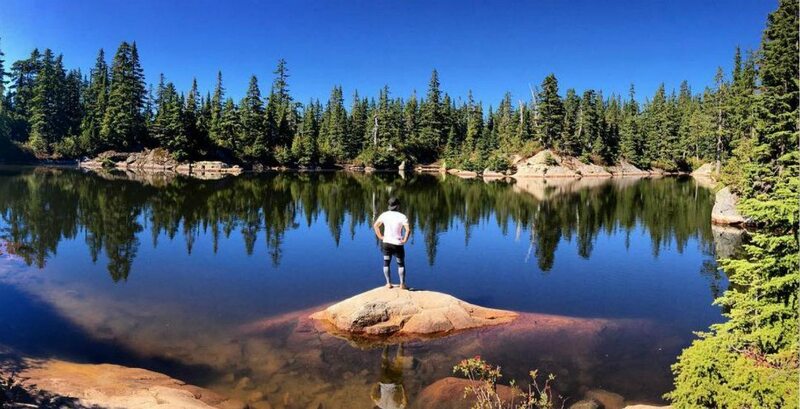 A favourite for mountain biking, canoeing, and fishing enthusiasts, Alice Lake is just a short detour off of the Sea-to-Sky. Pick up a pack of nut and seed mix or some gluten-free snack bars at a 7-Eleven en route to keep you going while you hike or bike around the park. In the warmer months, the lake is also a popular swimming hole. A birdwatcher’s delight, this sanctuary covers 300 hectares of land west of Ladner, and nearly as many different species of birds have been sighted there. Children are welcome, and the sanctuary can be a great space for them to learn how to appreciate and respect wildlife. Consider bringing a hot beverage for walking the trails on a chilly day. You can fill up your own travel mug at 7-Eleven with a coffee or hot chocolate. They also offer delicious, dairy-free drinks perfect for lactose intolerant and vegan nature lovers. Deer Lake Park is an oasis in the midst of Burnaby’s densely populated Metrotown area, with a network of trails and creeks throughout. Glide across the lake in a rental canoe, or walk the Boardwalk path around the shoreline. Make a day of it and have lunch in the picnic area. Fill your basket at 7-Eleven with sandwiches, wraps, nuts, and sparkling water. Large groups can even reserve tables ahead of time. Two hours of moderate hiking one way on the Baden Powell Trail leads to a huge payoff once you reach beautiful and secluded Cabin Lake. Begin by the downhill ski area on Cypress Mountain, and head in the direction of Eagle Bluffs. A favourite spot for a well-deserved dip, some of boldest swimmers will brave Cabin Lake in the spring and autumn months. Plan for two hours each way, plus any time spent luxuriating at the lake — you’ll want to bring plenty of water and snacks. Lynn Canyon has graced the Instagram profiles of many view-seekers who come to the park for its famed suspension bridge and crystalline pools. With an abundance of trails and plenty of viewpoints, you can choose your own adventure — a rigorous hike with a beautiful backdrop, or some rest and relaxation poolside with family and friends. Lovingly referred to by locals as “The Cove,” Deep Cove is great destination for those who love to be out on the water. Try stand-up paddle boarding or kayaking up Indian Arm. You might want to get an early start to make the most of that calm, unspoiled water, so grab a yogurt or fruit cup from 7-Eleven on the way. If your four-legged friends like to explore as well, dogs can walk off-leash on the trail up to Quarry Rock — an easy 1.5 hour hike with a gorgeous view of Deep Cove from the top. Spring is here and the most beautiful places in the Lower Mainland are calling. What are you waiting for? Stop by your nearest 7-Eleven store any time of day to get those healthy grab-and-go snacks you need for your trip, then get out there and explore!